So he set off and went to his father. But while he was still far off, his father saw him and was filled with compassion; he ran and put his arms around him and kissed him (Lk. 15:20). The parable of the Prodigal Son is perhaps one of the better known of Our Lord’s parables. His method of preaching was such that His parables are meant to lead gradually to the hidden reality that can be truly discovered only through discipleship (Pope Benedict XVI) or faith. What is the hidden reality of the parable we have just heard? The answer to this question may depend on a number of factors. The spiritual sense of Sacred Scripture can speak to our faith, our ultimate destiny, or it can lead us to act justly or morally. Given your age or life experience you may in turn, identify with each of the characters in the parable. All of us can in some measure identify with the prodigal son for all have sinned and fall short of the glory of God (Rom. 3:23). Perhaps, like the father in the parable you are in search of a family member who has distanced himself or herself from the family or from the Church, and you long for their coming home. Or you may identify with the elder brother; like him you have borne the heat of the day’s work. Perhaps you have shouldered heavy responsibilities without any help from other family members – perhaps in the care of an ailing parent; or perhaps you may feel that your sense of duty and responsibility is taken advantage of far too often. We are defined by our relationships; and the dynamics of relationships described in this parable, like the dynamics of our own relationships, are predicated on the virtue of justice. In common usage, the term justice implies rendering to every man his due (‘dare cuique suum’, Ulpian). In the parable, the younger son asks the father for the share of the property that will belong to him by virtue of the laws of inheritance. The older brother complains that the younger brother who has squandered his inheritance, is upon his return treated in a manner that clearly violates what is just; despite the father’s assurance that all he has does indeed belong to the elder brother. Clearly the formula for guaranteeing justice in the world – to render to every many his due – both in the parable and in reality has shown itself to be lacking. No material goods or equal redistribution of wealth can guarantee real happiness. In order to be happy, truly happy, man needs something that cannot be guaranteed for him by the law of justice. The Christian understanding of life’s purpose and meaning goes beyond the demands of strict justice. We are wont to speak of justice tempered with mercy precisely because all have sinned and fall short of the glory of God (Rom. 3:23). St. James declares that judgment is without mercy to one who has shown no mercy; yet mercy triumphs over judgment (Jas. 2:13). This compassionate perspective on life and specifically, man; that is to say ourselves and others, is the something that enables us to triumph over strict justice. It could be said that this attitude of compassion and mercy is our response to the God who has loved us first. In this is love, not that we loved God but that he loved us and sent his Son to be the expiation for our sins (1 Jn. 4:10). Our entire Christian life is a response to God’s love. The first response is precisely faith as the acceptance of God’s search for us. And the personal yes of faith marks the beginning of a story of friendship with the Lord, which fills and gives full meaning to our whole life. 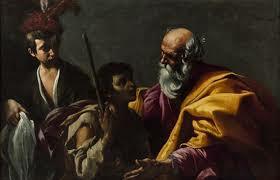 The parable of the Prodigal Son is a clear expression of God’s initiative that precedes us and summons us. So he set off and went to his father. But while he was still far off, his father saw him and was filled with compassion; he ran and put his arms around him and kissed him (Lk. 15:20). The hidden reality of this parable that the Church proclaims is the truth about God and about man. God is rich in mercy (Eph.2:4), and man is the recipient of this mercy; and no matter how disfigured we may be by sin and its consequences, the truth is that where sin increased, grace abounded all the more (Rom. 5:20). This is the hidden reality of the parable that enables us to rejoice with God whenever those who are far from God return to Him; no matter how long the separation has been. To be cured of the illusion of self-sufficiency is always the first step on the path of reconciliation. But we had to celebrate and rejoice, because this brother of yours was dead and has come to life; he was lost and has been found (Lk.15:32). This hidden reality is in fact an open secret evident for all to see for it describes the nature and purpose of all of the Church’s efforts, always and everywhere. This parable teaches us that God is love and that man who is created in God’s image and likeness can only be truly fulfilled by the love of God and our love for God. On this Laetare Sunday when the sacred liturgy enjoins us to rejoice and exult (Cf. Introit of the Mass The Roman Missal), the lessons of the Mass help us to hasten toward the solemn celebrations to come with prompt devotion and eager faith (Collect, IV Sunday in Lent; The Roman Missal. In a few weeks we shall celebrate the great Paschal Feasts and on the eighth day of Easter celebrate the Feast of the Divine Mercy. Let us prepare for them by being reconciled to God through Sacramental Confession; a sacrament which we must approach at least once a year during Lent or Eastertide. In the joy and peace that come from our experience of Our Father’s mercy, may our lives of faithful obedience to the will of God and of generous service of both God and neighbour be a source of healing and hope for our fragmented world for we are ambassadors for Christ, since God is making this appeal through us…be reconciled to God (2 Cor. 5:20).